The rich ore deposits around Silverton are the results of volcanism, much like many other significant mining districts around the western US. In fact, the basin in which Silverton lies is actually an ancient volcanic caldera, formed over 20 million years ago. In the following years, hot water circulated through the fissures in the rock, concentrating rare metals into cracks. Those cracks then became ore veins, waiting beneath the rock for some prospector to come along. Silverton, CO, had its first settlers arrive in 1870 and set up a small mining camp. By 1875, it consisted of over 100 structures to support the mines and miners in the hills above, and also witnessed the opening of the post office and the first school. By 1876, Silverton was formally incorporated and the Denver & Rio Grande officially announced it would build out its rail network towards the new town. Arrival of the narrow gauge rails didn't happen for some six years. It would be early July 1882 before the Silverton Branch was completed, connecting Silverton with Durango and the outside world. 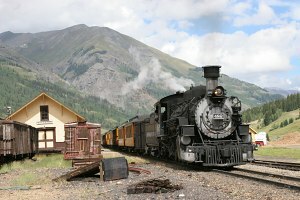 By the time mining in the region had run its course, Silverton would have the distinction of being the only town in the US served by four narrow gauge railroads at the same time - the Denver & Rio Grande's Silverton Branch, the Silverton Railroad over Red Mountain?, the Silverton Northern to Animas Forks, and the Silverton, Gladstone & Northerly to Gladstone?. Mining went through a series of boom and bust cycles, but for the most part consolidated to a few worthwhile mines after the Great Depression. None of the other three lines serving Silverton could every really be considered a success, and all were abandoned by the early 1940s. The last active gold mine in Silverton - the famous Sunnyside Mine - closed its doors in 1991, unable to make a profit. Fortunately, another industry had long since taken hold in Silverton, preventing it from dying off like many other gold mining towns that went bust. Of course, that industry was tourism, and was intimately tied to the narrow gauge trains that had hauled miners in and ore out for the decades before. The Rio Grande had wanted to abandon the Silverton Branch in the late 1950s and early 1960s, but was refused by the ICC. Thanks to the persistence of a few individuals and some mild promotion by the Rio Grande, tourist traffic on the Silverton mixed trains began to grow. The Silverton Branch eventually outlasted all of the other narrow gauge routes that linked it to the wider world. Most notably, it survived as 45 miles of isolated line when the rest of the San Juan Extension and Farmington Branch were ripped out in 1970. Today, Silverton gets over a hundred thousand tourists delivered to them every year from Durango by the Durango & Silverton Narrow Gauge Railroad. Around noon on Friday, 12-Sep-1975, the southeast end of the Silverton depot was ripped apart by a charge of dynamite. The exact time varies between between 1150h-1153h, depending on the report. Despite rewards offered by the railroad, the San Juan County Historical Society, and the town of Silverton, and investigative efforts by law enforcement all the way up to the FBI and ATF, no one was ever convicted of the crime. By 1975, the railroad had already donated the building to the San Juan Historical Society. The society undertook the estimated $15,000 repair job using $5000 in insurance money, combined with donations from individuals. Donors giving more than $5 were offered a square nail from the damaged section of the structure, and those giving more than $1 were sent a copy of the "Wanted" poster printed up to advertise the arrest reward money ($2000). Olathe Construction Company was awarded the contract to rebuild the damaged structure, and wrapped up the job in late November of the same year, only a bit over 2 months after the bombing occurred.